The Brexit shock has given the economy “a good kicking” according to a special set of surveys of businesses taken in the wake of the European Union referendum vote, which suggest the UK economy is now contracting at its steepest pace since the last recession in early 2009. The “dramatic deterioration” will significantly increase the odds of a major monetary stimulus from the Bank of England next month to support the economy. Markit/CIPS surveys of firms’ purchasing managers conducted in recent days suggests activity in both the UK’s services and manufacturing sectors have slipped into contraction in the wake of the 23 June vote. The Purchasing Managers Index reading for the services sector in July was 47.4, well below the 50 mark that signals growth. The reading for manufacturing was 49.1. Combined, that takes the “composite” PMI reading for the economy to 47.7, down from 52.4 previously and its lowest level since April 2009. 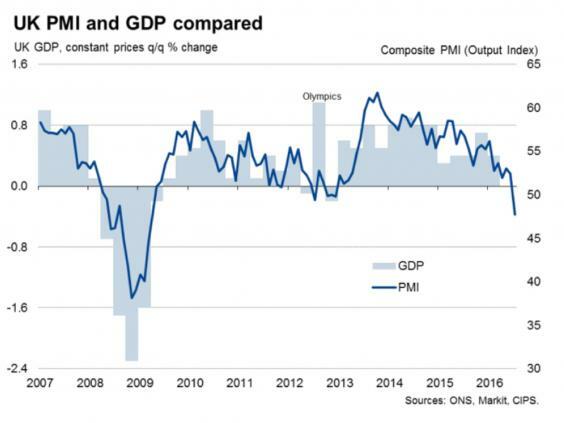 “July saw a dramatic deterioration in the economy, with business activity slumping at the fastest rate since the height of the global financial crisis in early-2009” said Chris Williamson, chief economist at Markit. Economists have slashed their growth forecasts for 2016 and 2017 in the wake of the Brexit vote, with a majority surveyed by Bloomberg expecting the UK to return to recession for the first time in seven years. Howard Archer of IHS Global Insight described it as “a truly horrible survey” which suggests the Brexit vote is giving the economy “a good kicking”. 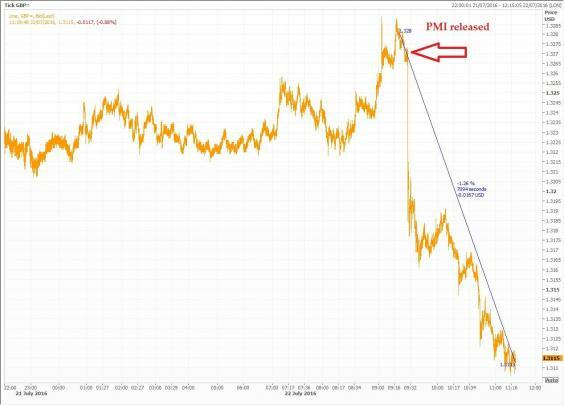 The readings were worse than City of London traders had been expecting and the pound instantly sank more than a cent and a half to $1.3115, in the wake of the release, having been trading at $1.3280 previously. The Bank of England held off from cutting interest rates in July further from their record low of 0.5 per cent, despite comments from the Governor, Mark Carney, in the week after the vote that an easing of monetary policy was “likely” over the summer. But the minutes of the July meeting did say that a majority of members of the nine person Monetary Policy Commitee “expect monetary policy to be loosened in August”. “It is now even more certain that the MPC will take action to support the economy when it meets early next month” said Martin Beck of the EY ITEM Club. 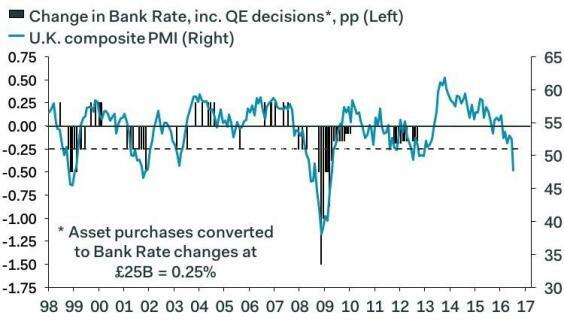 Samuel Tombs of Pantheon Macro said the composite PMI’s current level was historically consistent with a cut in interest rates by the Bank of 0.5 per cent, although he thought a 0.25 per cent cut was more likely. How big a rate cut now? This was a special set of PMI surveys by Markit/CIPS, taken and released earlier than usual to give an indication of how the private sector is responding to the surprise vote by the UK electorate to leave the EU. They were based on 85 per cent of the usual responses and they were collected between 12 and 21 July. The PMIs are a closely watched early indicator of real economic activity by financial traders and official policymakers. Services account for around 80 per cent of the economy and manufacturing 10 per cent. 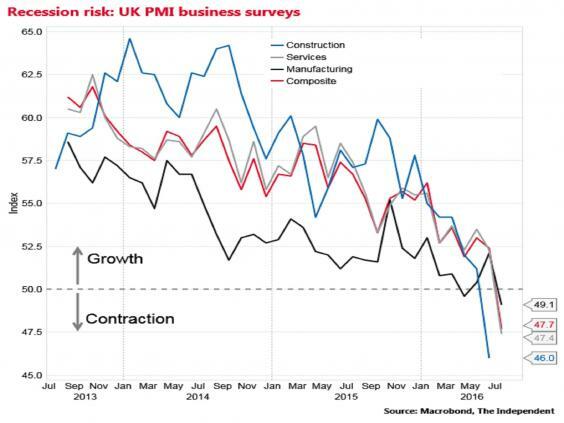 The surveys did not cover construction firms, which cover some 6 per cent of UK GDP, but that sector was already in contraction in June according to Markit/CIPS. The manufacturing PMI reading in the previous month had been 52.1 and for services it had been 52.3. The drop in the services reading to 47.4 was the steepest monthly decline since the PMIs began in 1996. City of London economists had only been expecting a decline to 49.2. The bleak PMI results contrast with a report released on Wednesday by the Bank of England’s regional agents – seen as the central bank’s “eyes and ears” on the ground – who reported that the majority of firms they contacted in the wake of the Brexit vote “did not expect a near-term impact from the referendum result on their capital spending”. Yet the agents did report that around one third of firms expected “some negative effects over the next twelve months, with reports of a ‘risk-off’ approach to expenditures and some imminent plans for spending slipping”.